Image: File photo shows Afghan children waiting with their water canisters in the town of Bareekab, some 30 kilometers north of the capital city of Kabul. The United Nations says nearly 8,000 Afghan civilians have been killed or wounded this year in the US-led war. On Wednesday, Mark Bowden, the UN humanitarian coordinator, appealed for USD 405 million to cover the costs of humanitarian programs for Afghan people in 2015. More than 100,000 people have been forced from their homes in Afghanistan while 4,000 families are currently facing a tough time without adequate housing as winter is approaching, Bowden said. Half a million Afghan children die each year of preventable disease across the war-torn country, he added. Some 1.2 million children are “acutely malnourished” and food insecurity affects almost eight million people in Afghanistan, the UN coordinator said. Elsewhere in his comments, Bowden raised concerns over the presence of some 225,000 Pakistani refugees in Afghanistan, saying it has added to the country’s humanitarian problems. 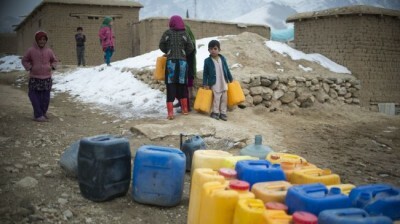 Last year, the UN demanded USD 406 million in aid for Afghanistan, but only received USD 237 million. The United States, Britain, and their allies invaded Afghanistan on October 7, 2001, as part of their so-called war on terror. Although the offensive removed the Taliban from power, insecurity remains across the country. The Taliban militants have stepped up their attacks against the Afghan government, foreign forces and civilians. The group has vowed to escalate the attacks on Afghan forces and US-led troops, their bases, diplomatic missions and vehicle convoys before the foreign forces exit the country at the end of this year. The Afghan parliament recently approved the controversial Bilateral Security Agreement (BSA) between Afghanistan and the US, which allows foreign troops to remain in the country beyond 2014.